Having a dog in a wedding used to be quirky and somewhat unheard of but more and more young couples are including their pets in the festivities. After all, weddings are family affairs! You can dress up their role as little as or as much as you want, but regardless, their presence will make everyone smile. 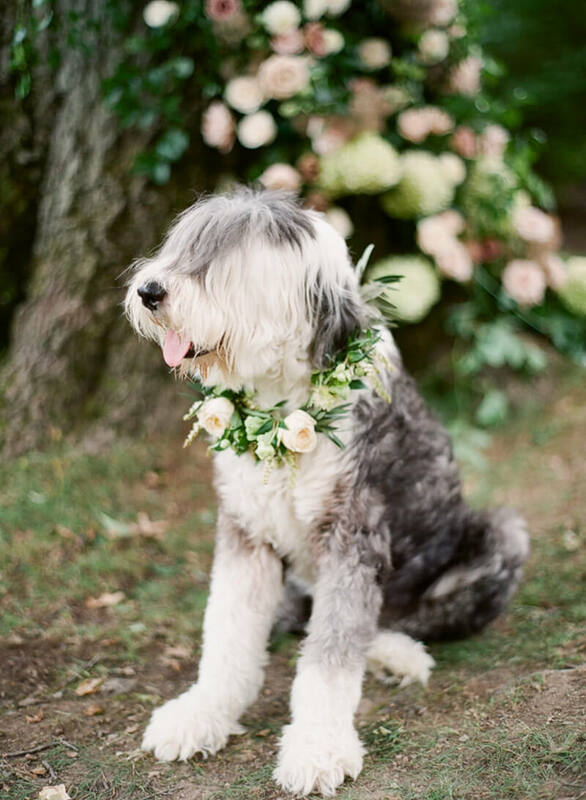 This shaggy boy looks handsome with a lovely floral collar – a beautiful way to dress up your pup without wrangling them into a suit. This couple’s little guy dons a simple black bow tie for his debut. And look how happy it makes him! Of course, you have to include your pets in a few wedding photos to make sure you capture their special presence. Just make sure they don’t get spooked! This little lady also wears a floral collar that matches the bride’s bouquet. It’s a simple, pretty way to make sure your four-legged family member looks their best, too! If you want your pet to play an active role, there’s no harm in letting them walk down the aisle! This little girl shines in pearls as she walks down the aisle with a ring bearer. If your pet is an extra special soul, you can make them a shining star of the ceremony. This furry girl is the Maid of Honor in her best friend’s wedding, and her burlap bandana and pink leash make just the style statement. Our dogs are there to pick us up when we’re down and wag their tails when life is great. Including them in your wedding is not just adorable, but it's a nod to what’s important in your life. Find cute, creative accessories that they can't chew and won't irritate their skin. And don't forget the dog treats to reward them for their good behavior!